Equipment used :- Ghost Pros, K2 Meters, Mel meter, Laser Grid, Full Spectrum Video and Still Cameras, SB7 Spirit Box and Digital Voice Recorders in all sessions. As always ghost pros and K2 meters were given to the guests to see if any communication could be established with spirit, almost immediately the ghost pros were lighting to indicate spirit presence. 2 female guests were talking to a female spirit that claimed to be Jane Seymour and another that said she was the spirit of the bride who became trapped in a chest and was not found until many years later. We started a spirit box session and noticed a female scream lasting about 3 seconds over multiple sweeps, this was also heard by a male guest. Were these screams of the trapped bride? This next session became much more active with guests interacting with spirit and asking plenty of questions through the ghost pros. We had male and female spirits present. A female guest managed to communicate with the bride on several occasions and also a male spirit that worked at the hall who died in the 1880s. Another female guest using a ghost pro was speaking to a chamber maid in her 20s from the 1800s and an older chamber maid in her 50s from the 1700s. We held EVP and Spirit box sessions but no voices were captured. Activity started before the guests came into the area, as just outside the doorway our next group could already sense spirit. A couple of the guests were being prodded by “unseen hands” and when they questioned Steve (GHE team) he told them that there had been the spirit of the “house master ” standing in that spot all evening and he keeps prodding people. All of the group where taking photos in and around the area before we went into the Seymour Room where the guests carried on taking photos as they were capturing many unexplained lights, orbs and the odd mist here and there. Ghost pros and K2s were being used by the guests that weren’t taking photos but they were having photos taken of them while they were trying to communicate. Michaela captured 2 very bright anomalies located against the ornate woodwork which actually looked like light bulbs but clearly were not. We (Wayne and Paula) joined with Louise (GHE team) and the female guest and her boyfriend from Session 2 and went for a snoop around the building and eventually made our way to the room upstairs that Steve was using for all of his séance sessions, where we met Kerry (GHE team) and some of the other guests. We started to call out for spirit to copy our tapping and whistling but all was very quiet. After chatting about table tipping the huge table at Fort Amherst we decided to try table tipping with a large table that was in the room. The room is carpeted and the table has metal feet and was very heavy but we all gathered (probably about 8 of us) round the table and began to put our energy in to trying to get a spirit to move the table, which it did faster and faster the table then moved bit by bit across the room until it came to a standstill, then with no warning slid by itself in one smooth movement, amazing everyone, quickly back towards Kerry and Paula for about 12 inches. This special ghost hunt was only open to our best customers; the plan for the evening was complicated to say the least as I didn’t want to have team members only being in one area throughout the night. The objective was to have different team members in different areas doing different activities and for the guests to choose what they wanted to do and who they would join for each of the three hourly sessions. Surprisingly it wasn’t too hard for all the guests to understand, however as a team it was a little more confusing because no-one knew neither where they were going nor who with. I started in an area only known as 36, this is a magazine room at the far end of the Fort which in the past has proved to be a very active room. After started a séance circle and asking for any spirit to move us in any way they could, we were joined by a spirit called Michael who was a carpenter. He appeared to be wearing dungarees and a vest and had a carpenters pencil behind one ear. He was about 5’11” in height and of a stocky build aged in his mid-40s. Michael started by moving our hands gently and when the majority of people had their hands moved (usually on command) he progressed to gently pushing and twisting people. However this turned very quickly into pushing people into other people and twirling others on the spot. Some of our hands were dragged on to the floor, which is fairly common and then once the majority were kneeling down Michael was able to push people more easily. David (guest) had his face stroked first and then as Michael became more adept at moving us was able to push David on to the floor face first, much the amusement of the rest of us. Everybody felt some movements, some were treated to more forceful movements whilst the rest had more gentle movements and several guests had their faces, chins and shoulders rubbed. Odd smells seemed to fade in and out of the room with some smelling a sulphuric aroma whilst others smelling a lead paint aroma. As the session went on Jason (GHE Camera) thought he heard a voice say “It’s alright” although no-one else heard this. We are hopeful that this will be captured on the video footage. Several other noises were heard throughout the session including something being dropped or thrown. It sounded like a pebble being kicked across the floor. Lights and other sounds were also seen and heard coming from the entrance to the room. After we had all had our arms stretched towards the ceiling and dragged on the floor Michael tired of our presence at started pushing some of the guests and pulling those with their back towards the door in the direction of the door. We took this to mean that he wanted us to leave the room. So I asked him to step back and I closed the séance circle. The Second group I chose to go to room 10, which we call it the spider room, because this is predominantly where the majority of the biting cave spiders reside and nest. The best way to visit this area is not to look up especially if you are afraid of spiders! After forming a séance circle in the left hand room a spirit called John joined us, he was a plumber/boiler maintenance man, very plump and came from the late 1940s. He started by gentle moving arms and then pushing and pulling the guests backwards. This mostly happened very randomly with no-one knowing who was going to be moved and when. Arm movement was restricted to me and the people either side of me but everyone got pushed or swayed. I then left the séance circle but stayed in the room to try to direct the spirit to move the guests which worked well. During this whole session we could all hear some odd noises, the funny thing is that we could all clearly hear the noises when we were talking, but as soon as we stopped the noises seemed to be quieter. The odd sounding noises ranged from whispering and mumbling to full blown talking, which I went to check to see if anyone was near us. They weren’t and it was quieter outside of the room. Apparently when I left the room everyone felt the atmosphere change and all the candles in the room flickered violently, but when I returned the candles didn’t flicker at all. Other noises continued as we moved throughout the tunnel complex with the sound of footsteps on concrete, but most of this tunnel the floor is either broken stones or loose sand. The third séance session was held in area 26 and more of an experiment for me as I wanted to try to something that I encountered a few months ago at another venue. I wanted to direct spirit to do particular things to certain people without their knowledge. So I started in the circle to help build the energy levels and then after there was some gentle arm movements and gentle pushing I left the circle. As I moved around the room I asked the spirits to move people that I pointed to. There were three spirit energies in the room. One was a Captain Bell who was a Second World War soldier, the other two joined us a little while into the session, they were both prisoners but neither gave me their name. All three spirit energies were quite happy to push and pull the guests. As it is quite difficult to explain what happened to whom and how, the video of this session will be published so that everyone can see the result. Generally though, most of what I asked to happen to the particular guests that I pointed to (without them seeing) happened. At one point the majority of the circle were on the floor, two guests (Darren & Russell) had their faces pushed onto the floor and when they stood back up they looked like they had just returned from a coal mine! This proved extremely funny for everyone else! After these controlled sessions we then allowed people to go to various parts of the Fort to experience activities that they hadn’t experienced before or for us to try experiments with the guests. I joined a group in room 36 who were with Sue & Kerry (GHE team) who were attempting a human pendulum experiment. When I walked in the room they asked me for some more questions to ask as they had run out of ideas. However I was more concerned with a spirit that I have seen many times in this room. Her name was Annie and she was a Nurse. She also took a dislike to Darren (who was the pendulum) and she wanted to do something different to Darren. I then asked one of the guests to leave the room so that I could tell him what Annie was going to do and then we both re-joined the room. Darren started to feel his legs and knees shaking and after much encouragement from the other guests in the room Darren started to feel his right leg lift off the floor, he also said that he felt dizzy and strange. I stood behind him and placed my hand on his back to give him more energy until Darren started to sway and he seemed to stand in an odd position. I then asked Mark (guest & the person I told) to come and place his hand where mine was. This is when it got really interesting as Mark and I had to stop Darren from falling over many times. It was similar to a Weeble, wobbling all over the place but not falling over because we were holding him up. Annie however made Darren feel odd and when she couldn’t do anything more than lift one leg, she did manage to lift one of his arms and make him shake violently. This was an excellent ghost hunt with lots of activity throughout all sessions and with all team members. Hopefully we achieved what we set out to do, which was capture and record some amazing activity for the guests as the majority were experienced ghost hunters. The majority of the team enjoy Fort Borstal as we always get some good activity, this evening was no different and some of the séance sessions in the counterscarp galleries were very memorable to some of the guests. This area is one of the best areas for the feeling of being touched or moved in some way. The first group to the counterscarp galleries I started asking for some gentle arm movement from the spirit energy who stepped into the room, an old prisoner of the fort who had lots of energy and Captain Daniel Bedford who usually gets some guests on the floor. The prisoner spirit started by moving my arms and the two people either side of me. Most of these movements were gentle touching of faces and some of the men’s chests. This quickly moved onto touching people shoulders and one particular guests fur jacket although he was intrigued by a female guests’ jacket which had the appearance of someone in authority. Several times the people who were standing beside me were pulled by their arms down to the floor or made to bend over as there was a heavy weight on our arms. Several times my hands touched the floor and then it was wiped clean on some other guest’s jacket! When asking for the spirit to sway or push people only one of two people could feel his presence and they felt a gentle or slight pull back or push forward. The second group to the counterscarp gallery the movements started almost as soon as I asked for spirit to move us, with the two people either side of me. This started as gentle arm movement, which quickly descended into various people’s arms being twisted and entangled with some guests being forced to twist and turn to face the opposite direction. Several guests also had their faces touched by spirit via other people’s hands, this some people found unnerving. One particular guest asked to be pushed into the centre of the circle and although it didn’t happen instantly, eventually this guest found herself standing in the middle of the circle with her hands entwined with other guests that didn’t know what the spirit were intending to do. The spirits that were responsible were two prisoners, Biffa & Justin and these spirits I have met before. They are particular with making sure the guests want to be moved and if the guests didn’t ask to be moved they weren’t moved. At various times the majority of the group were pulled by their arms and hands onto the floor and even when the guests were able to stand up, many of them felt that they were being pulled back into the wall or rocked gentled, sometimes forward and backwards but also in circles. This is a common experience from these two particular spirits, this seems to be their thing and it usually happens first to a female member of the group and then once the spirit knows that people don’t resist then they do it all the more. This can make some of the guests feel unwell as we conduct all of this in virtual darkness. People find it a little disconcerting to be rocked and swayed when they cannot see what it causing the movement and no matter how much they try not to move the spirits are always able to move people in one direction or another. The third group to the counterscarp galleries was a larger group than the rest of the groups although this seem to have no effect on what the spirit could do, we were joined quite quickly by a spirit who I usually encounter in this area, a First World War soldier; Captain Daniel Bedford. This spirit also has a particular thing he likes to do, which he didn’t achieve with the first group. This always ends up with many of the guests being dragged to the floor by their arms and after initially asking for him to lift people’s arms, which he completed just to prove that it was possible he then moved onto moving people in the way he wanted to. This involved the two people either side of me first (Kat & Neil) and then the people standing next to them until the majority of the guests were being moved. Arms were being lifted towards the ceiling, whilst others were being pulled to the floor. This proved to be quite painful for some and involved just about everyone being touched in some way. At various times many of us were twisted and entangled by our arms, sometimes whist we were on the floor. Kat was pushed down until she was kneeling on the floor, yet each hand was being pulled away from her. Then she asked whether the spirit wanted he on the floor face first, she asked that her left hand be raised if this was true and immediately her left hand was raised, then dropped and pulled away from her until she had no choice but to obey the spirits wishes. After asking for the spirit to push and sway people many people were swayed and pushed into a wall, Neil found himself being pulled backwards towards a wall to the point where he had no option but to sit on the floor with his back against the wall and once he was down then the spirit were able to pull the people either side of him down (Me and Harry) and then subsequently the people next to us. At various times those who were being moved were twisted and squashed up together so that all the dust that each of us had collected on our clothing was now being “transferred” to those who were less dirty. All of this twisted and entangling went on for a long time and every time that I asked for the spirit to put us back to where we started with all our hands by our sides, so that we could finish the séance part, it just didn’t happen, this just made the spirit want to continue moving us. After the third time of asking I told the guests to let go and thus break the séance circle. I don’t like to do this as I know that it has taken a lot of energy for the spirits to move us but had we not let go this twisting and pushed and being pulled to the floor would have gone on for a longer time. After the three controlled sessions, all the guests were then allowed to go to various parts of the fort with some of our ghost hunting equipment to hold their own ghost hunt. Many guests used this opportunity to try some table tilting, Ouija boards and semi-solo vigils to record EVPs (Electronic Voice Phenomena a.k.a. ghost voice experiments) and Spirit Box sessions (a device that scans the FM radio band at 100ms in reverse) to hear a spirit voice. Some of these sessions that the guests undertook on their own were very successful, although those that heard responses asking them to leave the room or area did so. This was an excellent ghost hunt which was very enjoyable to those guests who were moved or manipulated in ways that they never thought possible and many were surprised what could be achieved, especially the more physical nature of the movements. There will be an event video (edited into a shorter video) of some of the group sessions. After making our way through the fairly spooky path to the site of the old manor house and handed out to the guests some of our ghost hunting equipment, spiritual activity was noticed and spotted on the various electronic gadgets quite quickly. I then left the guests to wander around the various parts of the grounds and joined them intermittently as different parts of the grounds guests feel and can interact with different spiritual energies. Whilst I was near to the terraces a familiar male spirit was seen. His name is Alfred and he would have been a head butler in the house. He often stands at the edges until I ask for him to do something physical to a guest, like a gentle touch or push. 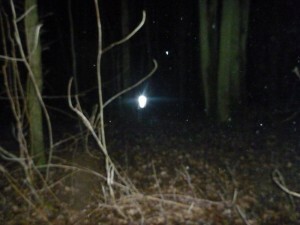 There were many spirit present, which is nothing unusual, but it is rare for them to interact with us unless there are asked to join in, otherwise they just watch with curiosity. Many guests were getting meaningful communication on various pieces of equipment and as I joined several groups of people I was able to tell them details about the spirit that they had not thought of asking or couldn’t get meaningful responses on the electronic equipment. 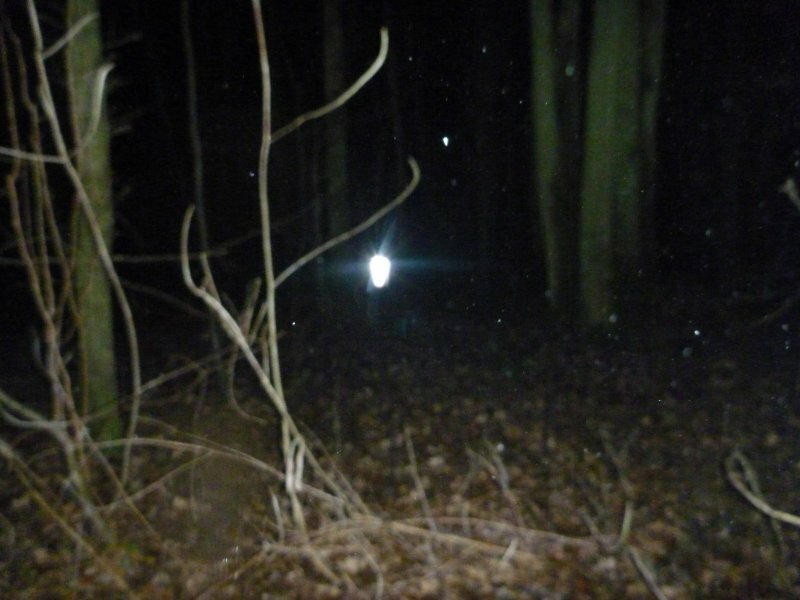 Many female spirit energies were spotted and toward the end of this session a brother & sister who were about 8 years old had taken a liking to one of the guests and followed her around the site. From the manor house we descended into the very spooky woods, the walk into the woods is scarier in appearance than actually being in the woods but that is because there are so many trees which are exposed out of the ground or knocked over by the strong winds that occur on this hillside. Once in a familiar place in the woods I started a séance circle so that all the guests could experience a physical paranormal encounter. We were joined by a spirit that I have seen on a couple of previous occasions. He was called Edward and was a local Engineer. Aged in his late 50s and mostly bald with dark brown and grey hair on the back and sides. Edward started by doing exactly what I asked; to gently move the hands of some of the guests and myself and the three people either side of me felt our hands gently move and when I asked the guests to ask in their heads or for others Edward did exactly what anyone asked with regard to moving hands. After a while Edward obviously got bored of doing what we asked and then started to do what he wanted, which seemed to be to stroke the shoulder of a particular guest, which she found a little odd, although it didn’t frighten her. Many guests reported that when my hands were near to them they could feel a lot of heat coming from my hands even when I wasn’t touching them. During this time other guests were gently swayed and rocked from side to side then all of a sudden the two people either side of me were pulled backwards, then pushed forwards and then pulled downwards by our hands towards the ground, which none of us wanted to touch because it was a little muddy! The séance came to an abrupt end because one person couldn’t follow the simple instruction not to break the circle and due to this incident another guest was feeling unwell and faint and this guest required some attention by me. After this I turned on my spirit box (a device that scans the FM radio bands at 100ms in reverse) and asked for Edward to say something to us or said one of the guests’ names. Many random words were heard but no answers to our questions. Once again a very enjoyable ghost hunt and one is which many guests had a physical paranormal encounter or were able to have some kind of communication with the spirits that reside within the grounds of the old manor house.